Your little one is finally asleep, that too after a struggle of an hour or so, Phew!! Why not lie down for a few minutes, and catch up with your Facebook notifications. So, you are scrolling through your Facebook, and THERE is it again, a picture of your ex-colleague (from the job you left, to be a SAHM) celebrating her promotion. You try to tamp down the envy ( read ” jealousy”) and scroll through. After a few seconds, you see a picture of your friend vacationing in an exotic location. And, try as you might, you can’t stop your mind from going on self-analysis mode. You are thinking, “people are doing things, going places, achieving goals, and so much more. What am I doing? Cleaning Poop!!”. You feel you are doing nothing of value, wasting a degree you worked so hard to earn. 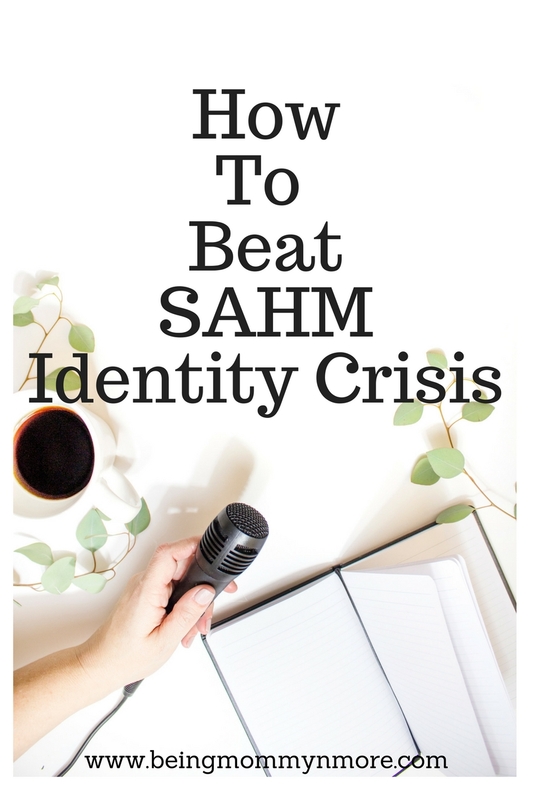 Before you know it, you become the victim of the dreaded “identity crisis”. I was in the same boat not long ago. Although I was always busy taking care of my baby, doing chores and all, I felt it was not worth mentioning, it was not important or worthy. In short, I was downsizing myself, and it was affecting my self-esteem and confidence badly. I was always frustrated and angry. I couldn’t go on like that. I knew something needed to change, and that something or rather someone was me. If I was not happy, how can I raise a happy child? As it is said, ” happy mom raises happy kids, ” and I wanted my baby to be a happy, bubbly kid. It took a great deal of effort to acknowledge, that I needed to change my perspective. But I did and started working on myself. Baby steps every day to be happy, feel confident and respect me. It took some time. But eventually, I overcame this feeling and found myself to be a better mom and wife. My confidence was back and I was a HAPPY SAHM now. Motherhood is a big step, and it is bound to bring change in your life, and to yourself. You have a little someone in your life which is entirely dependent on you. Of course, you will change, your priorities will change. You will be sleep deprived, messy, tired, but it’s all worth it, for your baby right? Love the MOM in you. Give your health some priority. Try not to skip meals or your little naptime for chores and some other work. The dishes can wait for some time; the laundry can wait too. Give yourself the importance you deserve. Its been days, since you set a foot outside the house, except for grocery shopping maybe. You are thinking, why to dress up when it’s going to get stained in a matter of minutes. But, do you remember how competent and confident you feel, when you are all dressed up and ready to go to work, or maybe to some party. You need to feel that confidence now. Click some pictures, and whenever you feel low again, or see yourself looking haggard in the mirror wondering where have lost yourself, just watch those photos and say this is me, happy and confident. I understand you don’t have much time to go shopping or spa to make you feel good. But doing small things for yourself also matter. Make yourself your favorite cup of coffee, just the way you love it. Cook YOUR favorite meal once in a while. Listen to your favorite song while bathing or nursing your baby. Just do something that makes you feel good. You are so lucky to be witnessing every little moment and milestones of your baby, spend time with your family. Live it, enjoy it, these are tge moments, you will cherish forever. It will give you the sense of satisfaction and happiness. Stop comparing yourself to others, trust me, it’s the best thing you can do for your self-esteem and peace of mind. Try to steer clear of social media, if you can, or at least reduce the time you spend on it. So, you might have quit your job, that doesn’t mean you can’t be aware of new trends and workings in your field. Keep yourself up to date with the happenings. Just knowing small tidbits will give your self-confidence a little boost. 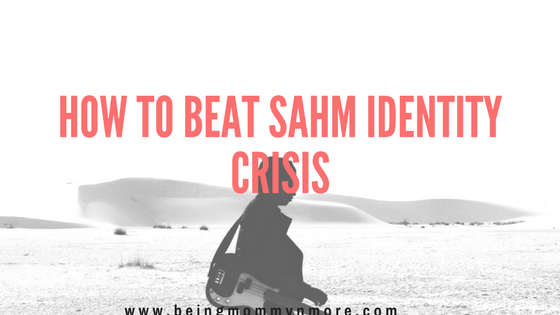 Over to you now, are you fighting the identity crises or have you overcome it? Have more suggestions to make it easier for others moms? Do tell me in the comments section. When ur baby will grow up..u will be able to tell him every small milestone he achieved with every small detail..and it actually matters a lot..
so true…i am grateful i am able to live and see him growing up every moment…. Very, very honest Writing! More power to you. Motherhood is not only about the child, but both. Mothers worry about their child reaching the desired milestone at every age. But, milestones are there for mothers too! Like the first time you breastfeed, the first bath of the child, etc. When any mom surpasses these milestones, it calls for a celebration! She should rejoice that she has done it successfully. And it will boost their confidence as well. very well said shivangi…..each milestone should be celebrated, after all the Mom has reached it through sleep deprivation, frustration, exhaustion and whole lotta love only a Mom can bestow. I hear you…and relate with everything you have said. I made a conscious decision to quit work during pregnancy. However, there are times when I challenge the wisdom of it. On the other hand, I don’t feel like joining full time work too. A great post, Poorvi! And find something that interests you. I quit my Banking job after motherhood to chase my passion of being a writer. Till date, I consider this to be one of the best decisions I’ve ever made. Very honest and insightful article. Thanks Sonia…. more power to you for chasing your passion….so many moms can learn from you to follow their heart. I am a SAHM too, though working from home still at times, its an overwhelming feeling. Great article. And I agree with all the points mentioned.